Posted on Mon, Mar 26, 2012 : 10:45 a.m.
I’m craving a detox something or other to balance the exigencies surrounding Drew’s second birthday celebration yesterday. Grilled burgers and brats set the stage. This salad — which I’ll munch on the next couple of days — should realign my sails. In the recipe below, I combined idle squatters consuming refrigerator space with pantry staples, but I'm thinking carrots, tomatoes, red onion, scallions, avocado or beets would be fine substitutions for any of the perishable ingredients listed below. I didn’t have any feta on hand, but the creamy, tangy sheep’s milk cheese would be a fine complement. If you’re planning on leftovers, leave out the greens and stir in just before eating. Here are links to other welcome-to-spring dishes I turn to when the boat is off-kilter: Grilled Salmon with Edamame and Oranges, Barbecued Asian Tofu, Roasted Beet & Beet Green Salad, Curried Israeli Couscous with Eggplant, Chickpeas and Cucumber Salad, Chickpeas and Cabbage Salad, and Roasted Broccoli & Farro Salad. 1. Cook quinoa according to package instructions, and cool. 2. Make a vinaigrette by whisking lemon juice, olive oil, and garlic together. 3. 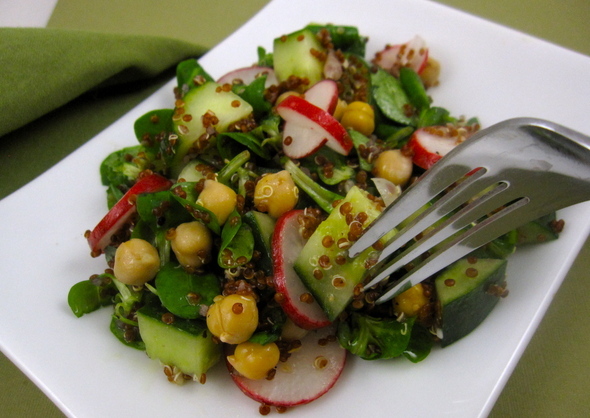 Stir basil, chick peas, radishes, cucumber, greens and quinoa into salad. Season to taste with kosher salt and freshly ground pepper. Top with feta, if using, and serve. Guess the color of the quinoa doesn't matter. I guess the kind in the photo is red quinoa. Last week I made a broiled chicken salad using brown rice couscous, so the dish is still fresh on my mind; I was, as I looked at the photo, thinking &quot;brown rice quinoa?&quot; before remembering that it was couscous I used. The first time I saw radish &quot;wheels&quot; in a recipe photo, they told readers how to put the &quot;wheels&quot; together. Cut slits in on two sides. Fri, Mar 30, 2012 : 9:02 p.m.
Mon, Mar 26, 2012 : 3:57 p.m.
Peggy - You've outdone yourself with this latest photo. If this newspaper thing doesn't work out, I think you've got a backup in food photography. The salad recipe looks good, too. Mon, Mar 26, 2012 : 4:11 p.m.
Aw shucks, Jeff.. It's the quinoa set off by the vibrant mache that did the trick. Thanks so very much for the comment. I hope the recipe lives up to the photo!